The trees undress themselves from the top down, as the sap slowly descends. A big wind and they're half naked, the leaves blowing about the garden and clogging its margins, forming tides under the shrubs. Our blackbird picks through them fastidiously, flicking them to one side with his beak and snapping up any insects hiding beneath. 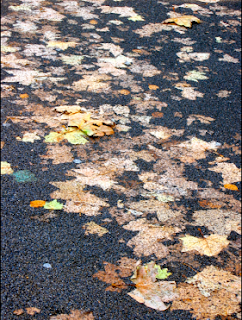 In Teddington one of the pedestrian crossings has been resurfaced with a new gritty, grainy Tarmac, and here the tough plane and sycamore leaves have been pressed into it by tyres, leaf-shaped shadows that will long outlast those lying on the pavements.